The Dutch Waterboard Vallei & Veluwe has officially opened Europe’s first commercial nutrient recovery facility, in partnership with Ostara Nutrient Recovery Technologies and Eliquo Water & Energy. Proactively addressing national and European goals to promote a circular economy, the new facility is part the Waterboard’s transformation of their Amersfoort Wastewater Treatment Plant (WWTP) into an energy and nutrient recovery factory, supported by the EU LIFE+ subsidy program. Waterboard Vallei en Veluwe is responsible for safe dikes, clean and sufficient surface water as well the treatment of wastewater in the delta’s of the rivers IJssel and Nederrijn. Vallei en Veluwe operates and maintains 28,244 kilometres of waterways and rivers, 81 pumping stations, 16 Wastewater Treatment Plants and 872 km of dikes, together with treating the sewage of 1,471,000 inhabitants. The new energy and nutrient recovery factory features, amongst others, Ostara’s Pearl® nutrient recovery and WASSTRIP® technologies, where phosphorous and nitrogen are recovered to create a high value fertiliser product from an existing resource with a process that is both environmentally and economically viable. The facility was designed and constructed by the Dutch company, Eliquo Water & Energy, and also features their LysoTherm® system which allows for an efficient, cost effective and reliable disintegration of waste activated sludge (WAS). While seven sewage treatment plants have been converted into “energy and nutrient facilities” in the Netherlands, this is the first facility to produce a “ready to use” fertiliser product, sold as Crystal Green®. During her speech at the official commissioning of the installation this week, Tanja Klip-Martin Principal at Waterboard Vallei en Veluwe called for changes to national and European regulations to help stimulate the use of recovered products from waste streams to be able to support the principles of a circular economy. “The key difference with the Amersfoort facility launched today is that a high value, ready-for-sale fertiliser product is being produced, ready for use on agricultural crops and in the turf and horticulture markets,” said Klip-Martin. “We are very excited to have partnered with Dutch Waterboard and Eliquo to provide the technology to effectively recover nutrients at their Amersfoort facility. Their efforts have allowed us to create a sustainable phosphorous fertiliser that will be produced locally and sold in the Netherlands, as the highest beneficial reuse of an existing resource. We are proud to be a key component of the Dutch Waterboard’s innovative energy and nutrient recovery facility which shows leadership on behalf of the industry in Europe,” added Phillip Abrary. 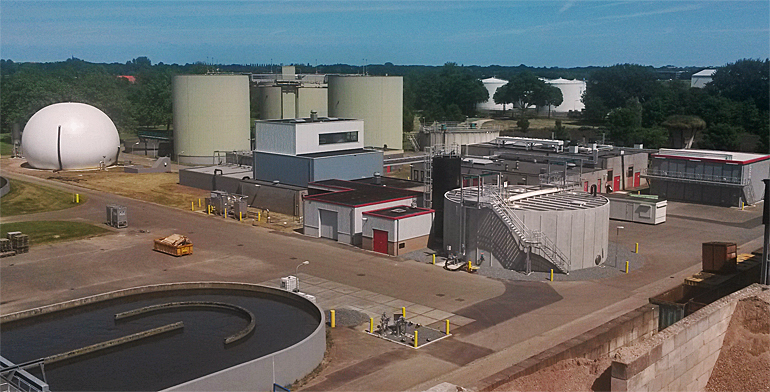 Designed to treat more than 8,000 m3 of water each day, the Amersfoort WWTP also acts as a regional sludge-processing hub for a number of WWTPs and imports approximately 40 per cent of sludge from other locations. With approximately 12,000 tonnes of dry sludge being treated annually, the facility was facing high operational costs for energy consumption and processing costs for sludge disposal. At the transformed Amersfoort WWTP, all indigenous sludge produced as well as the sludge produced at the WWTP’s of Soest, Nijkerk and Woudenberg will be centrally digested at the new facility. The process of digestion is being enhanced with Eliquo’s Thermal Pressure Hydrolysis (TPH) process LysoTherm®, in order to increase the biogas and related energy production. As a result, the new facility will produce enough energy to treat all the wastewater from the City of Amersfoort on a 100% energy-autonomous basis, as well as an energy surplus, enough to provide 600 households with green electricity during the year. Operations and resource recovery are further enhanced by removing phosphorous from the liquid wastewater stream using Ostara’s Pearl technology. The Amersfoort WWTP features one Pearl®2K reactor with the capacity to remove 85 per cent of the phosphorus and up to 15 per cent of the nitrogen from liquid wastewater streams. Phosphorous is a vital resource necessary to produce the food needed for long-term global food security. It is also considered a non-renewable, finite resource, as most conventional fertilisers are produced from mined phosphorous exported from countries such as Morocco. Ostara’s solution provides an innovative phosphorous management strategy, and a closed loop solution. Vallei & Veluwe’s nutrient recovery facility not only helps solve both nutrient supply – producing fertiliser from an existing resource – and nutrient pollution issues by releasing responsibly, but will also generate revenue for Vallei & Veluwe through the sale of the fertiliser. The valuable nutrients recovered are sold as a 99.6% pure, granular Crystal Green fertiliser, which is European Certified in the category with the highest quality fertilisers. This product is composed of phosphorous, nitrogen and magnesium (5-28-0-10Mg), and is sold and marketed by Ostara through a global network of blenders and distributors to professionals in the turf, horticultural and agriculture sectors. The new facility has the capacity to produce approximately 900 tonnes of Crystal Green annually, and Vallei & Veluwe will receive revenue for every ton of fertiliser it produces. The new nutrient recovery facility will also realize annual cost savings in chemicals, solid waste disposal, maintenance and power.